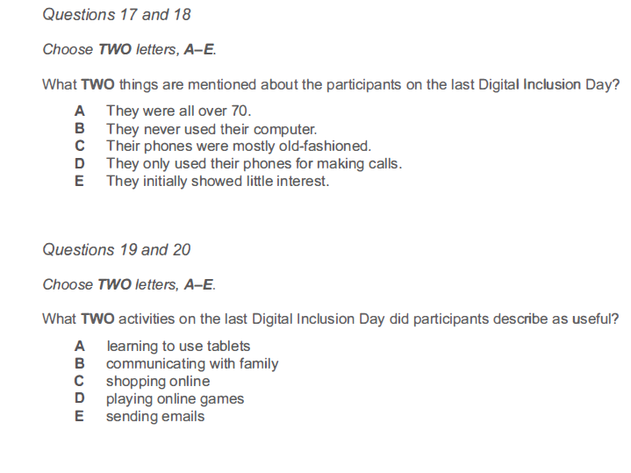 リスニング部分ーThe participants on the Digital Inclusion Day really benefited. The majority were in their seventies, though some were younger and a few were even in their nineties! Quite a few owned both a computer and a mobile phone but these tended to be outdated models. They generally knew how to do simple things, like send texts, but weren't aware of recent developments in mobile phone technology. A few were keen to learn but most were quite dismissive at first - the couldn't see the point of updating their skills. But that soon changed. said they felt much more confident about using social media to keep in touch with their grandchildren, who prefer this form of communication to phoning or sending emails. A lot of them also said playing online games would help them make new friends and keep their brains active.